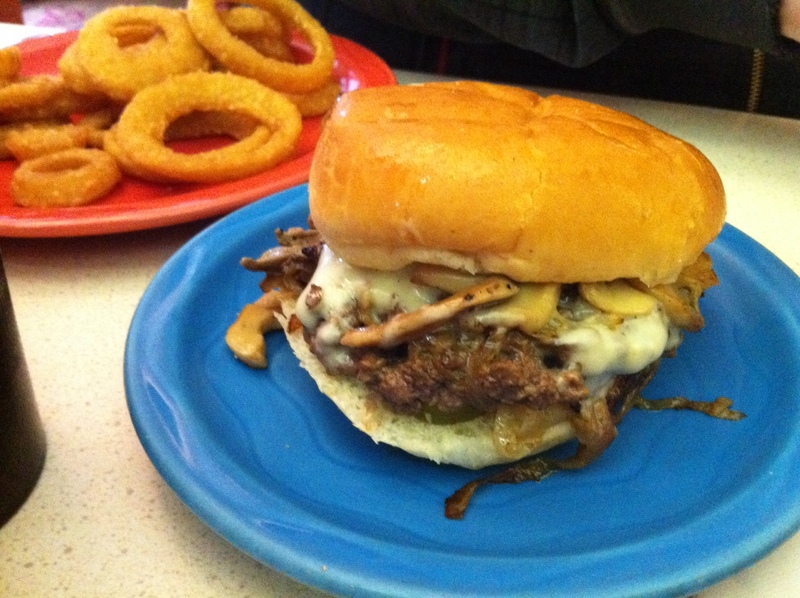 Stanley's burger comes topped with onions and pickles. If you’d like to step back to an anachronistic time when Bobby Vinton songs played on the radio but trans fats were a thing of the past, then Stanley’s in Central Falls is the place for you. 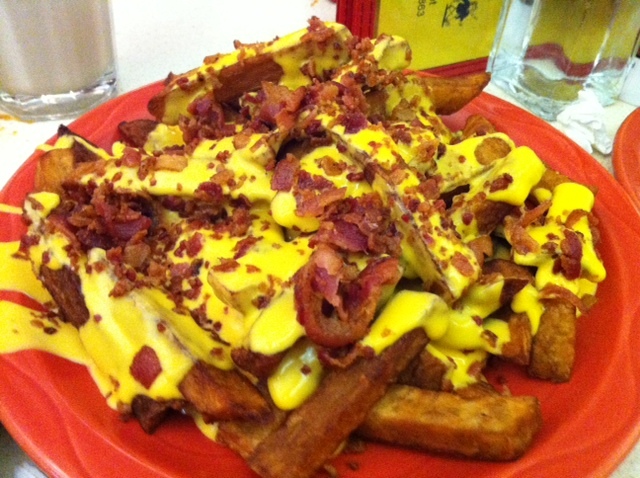 The cheddar cheese fries -- although I personally liked them better plain. I have to admit, I’ve had a better burger. Nonetheless, Stanley’s most certainly wins on character. The neon menu, metal ceiling fans, red and white vinyl booths, and Casey Kasem’s 1974 top 40 playing in the background (literally) form an ambiance that is not to be missed. The burgers are topped with pickles and caramelized onions (unless requested otherwise), and they have a selection of fries like no other (dirty fries, chili cheese fries, Quebec-style fries, cheddar fries). We also tried their ham and bean soup — I think the secret ingredient, as Marge Simpson would say, is salt. And just so you know, a “small” means large and a “large” means obscene. To top it off, do what I did, and get a coffee shake with your meal. I really haven’t had a much more satisfying burger, but I also factor the experience into my memory of the flavor. The burgers are cooked on a griddle, and pressed. And some of the onions are pressed into the meat, which can leave a slightly bitter-burnt taste that Michele objects to, but I like. The cheese is melty, the well-cooked patty is still juicy, and the bun is a soft, potato variety. Looking at that picture is making me crave a Stanley burger. I grew up on these things. Might have to go their tonight–it’s been a few years. They had opened a shop in Providence, but unfortunately it closed …last year maybe? Yes, the Providence place closed (I really liked it), and it’s now Blount’s Clam Shack. Yes I just drove by the other day and noticed that it’s now Clam Shack. Have you eaten there? Any good?